EUGENE, Ore.---One sailor's mast blew down, others worried about that or worse, and Walter Johnson's crew-wife Terry said, "We were going so fast that water was shooting up through the centerboard [housing]." 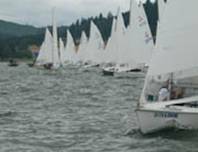 So went a weekend practice race for the 51st Lido 14 Class Championship scheduled Tuesday and Wednesday at Fern Ridge Lake, hosted by the Eugene Yacht Club. The storm winds of 18 to 20 knots were just what you don't want for this basic family dinghy, but the three-by-five-mile, horseshoe-shaped reservoir nestled in the Willamette Valley of west-central Oregon may have other ideas. 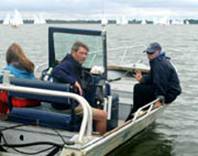 "We had a hard time keeping the boat under control," said Mark Schroeder, a local veteran sailing with his wife Sheena as crew. "It was a little more than a Lido would like to see." Conditions for Monday's three qualifying races to split the fleet into Gold and Silver divisions were much more manageable with south winds of 5 to 10 knots after morning showers, but when someone like Schroeder who has been racing on the lake for 20 years says, "This is unusual for us to get rain in August, but this year has not been very normal," who knows what to expect? The forecast was for rain to return late Tuesday afternoon and continue through Wednesday. Whatever the conditions, the best sailors have a way of rising to the top, a habit that makes favorites of four-time winner Stu Robertson and daughter Erin of Fountain Valley, Calif.; recent High Sierra Regatta winner Tom Jenkins of Arroyo Grande with crew Andrew Brown, and frequent contenders Freddie and dad Fred Stevens of Long Beach. 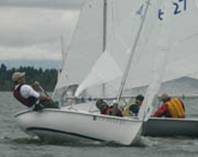 Not all of the above raced one another in Monday's divided fleets, but the top boats were Robertson, 1-1-1; Steve Schupak, 1-1-3; Jenkins, 4-3-2; event co-chairman Jim Sterner of Bainbridge Island, Wash., 2-4-3; Bob Yates of Newport Beach, 2-3-5, and Eric Heim, Newport Beach, 4-2-4. Mark Gaudio of Newport Beach, another four-time winner and current champion, is not competing, nor are usual contenders Kurt and Anne Wiese of Newport Beach, who had entered but withdrew because of a late business conflict. Dave Ullman, the biggest Lido 14 winner of all with nine titles from 1969 through 1986, is here but not to sail. He was the featured speaker at Monday night's luau dinner. Racing will be on a 1 1/4-mile-long windward-leeward course starting at 11 a.m. each day---conditions, of course, permitting. Veterans Roger and Anne Hinton of San Diego will have their mast back up after Sunday's collapse when a shroud chain plate tore loose in the blustery breeze. Schroeder said, "Normally in August you'd see very light winds with a high-pressure system sitting over the area, and when the land becomes warmer than the ocean the wind comes in from the sea (Fern Ridge Lake is about 40 miles inland). That's normal. This year has not been normal." All together now: "It's … never … like … this … here." The following tables how the rankings after the three round robin races of the Qualifying Series. All competitors were grouped into four different (seeded) groups with each group racing the other three groups once. Total points were accumulated for each boat to rank the boats with the top half being assigned to the Gold Flight of the Championship Series that starts on Tuesday. If sailing continues on schedule, none of the Qualifying Series scores or rankings will be used.